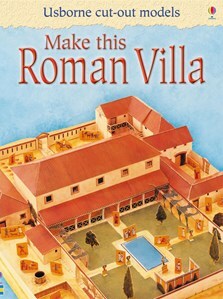 Printed on stiff card, this book contains templates to cut out and construct a superb model of a Roman villa crammed with authentic detail. The base of the model measures 60 x 46cm. Offers children aged four to eight a fun and interactive history lesson on the grand architecture and lifestyle of the ancient Romans. Rome wasn't built in a day, they say but, fortunately, this villa can be easily built in under an hour with adult assistance (a little or a lot, depending on the age of your young builder/s).The model proved engaging and challenging for its target audience, and we were able to bring this little piece of ancient Rome to 3D life with a minimum of fuss. And we thought the finished product was not bad at all for novice villa builder.